Summer is over. Fall is underway. Winter is coming (Dec. 21). 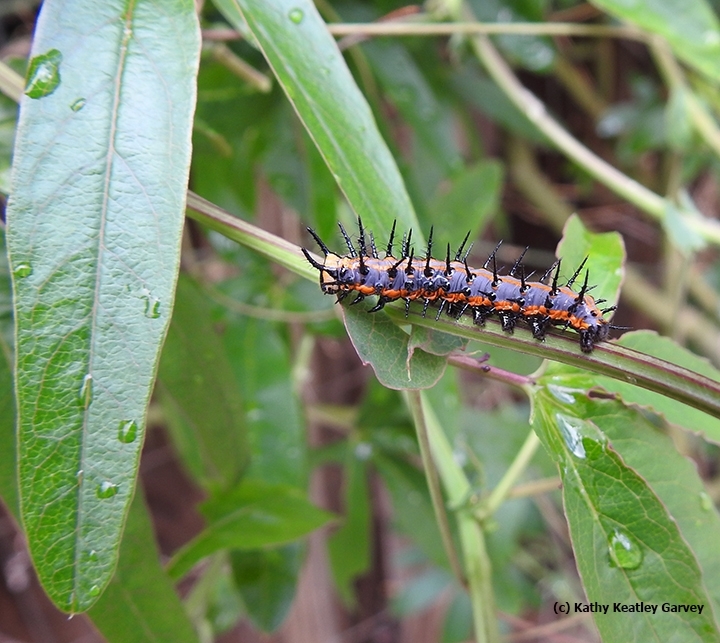 But the Gulf Fritillaries (Agraulis vanillae) are still laying eggs on the passionflower vine here in Vacaville, Calif. The eggs are hatching. The caterpillars are eating. The 'cats are pupating. And the adults are eclosing from the chrysalids. 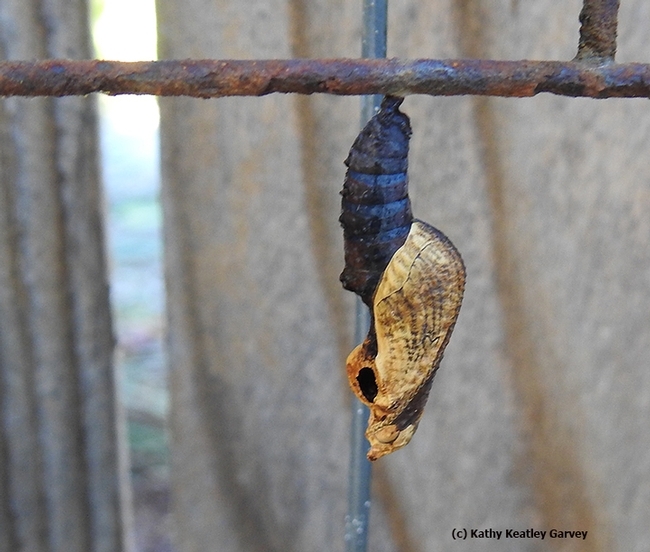 And then the cycle of life begins all over again: from egg to caterpillar to chrysalis to adult. Actually, we've seen Gulf Frits here year around--even photographed them laying eggs on Christmas Day. Gulf Frits don't go through diapause here. They mate year around. Of course, the survival rate is low. 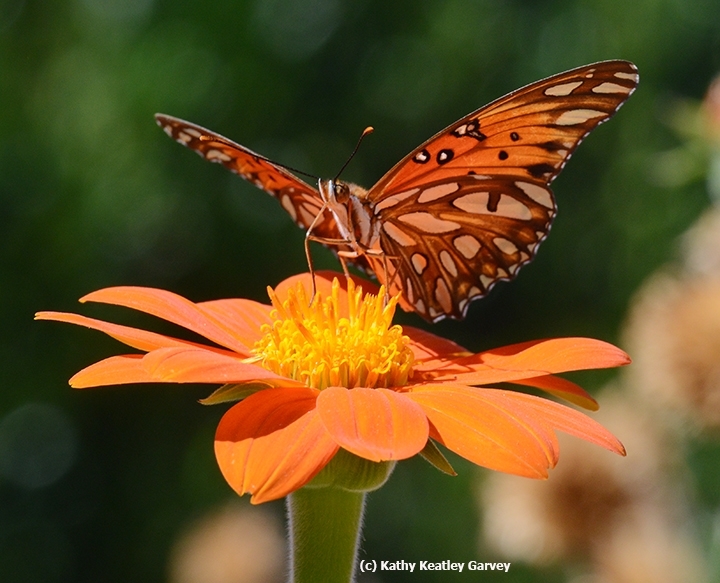 An estimated 95 percent of all butterflies don't make it from egg to adult, scientists say. We've seen why. Spiders, praying mantids, yellowjackets, European paper wasps, birds, diseases, and such parasitoids as tachinid flies and wasps that lay their eggs in the caterpillars or bore into the chrysalids. 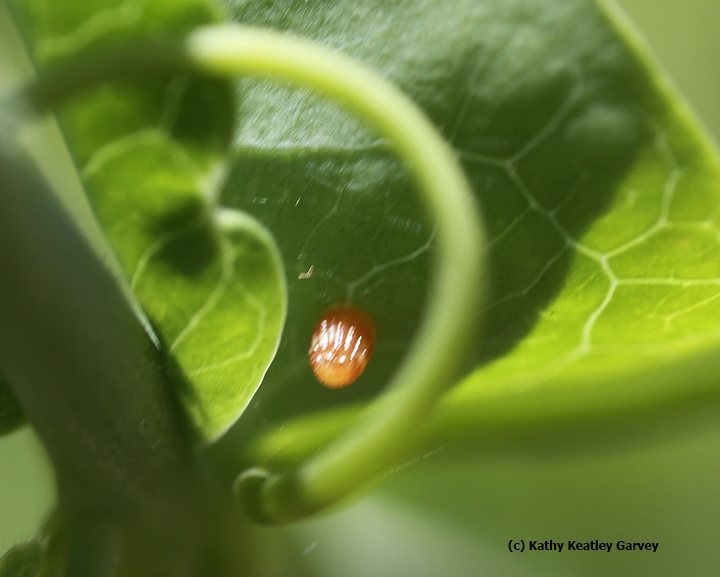 If you look closely, you can sometimes see the parasitoid evidence (hole), such as the one below. Art Shapiro, distinguished professor of evolution and ecology and an expert on butterflies, says that judging by the size of this hole, it was a large parasitoid--probably a big tachinid fly or an ichneumonid (wasp).